The OHLINDA Sofa has been part of our product line since 2015. It soon became a top seller and was awarded several design prizes, among them both the Iconic and German Design Awards. We are already talking about the new Bretz classic. Let’s take a look behind the scenes together with Bretz’s Creative Director Carolin Kutzera, who is the designer of OHLINDA. Like many pieces of the Bretz furniture family, the OHLINDA Sofa is a grab bag of most diverse impressions. Some of these impressions are even just simple everyday commodities: Summer 2014, when OHLINDA was designed, the Soccer World Cup was taking place in Brazil. Thus, everybody was talking about Brazil, and getting in touch with all the colors that resemble this country and the colorful Carnival in Rio was virtually a natural process. Furthermore, the world of fashion these days was also characterized by warm, expressive colors. Private living rooms, however, were still influenced by 50 Shades of Gray. 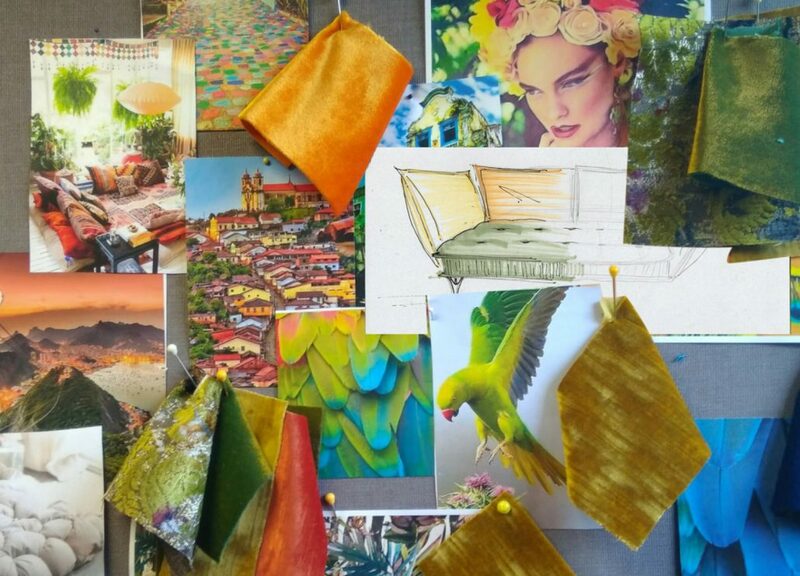 Colorful and self-confident: We wanted to create a sofa that’s colorful, lite and cushy, and free as a parrot. 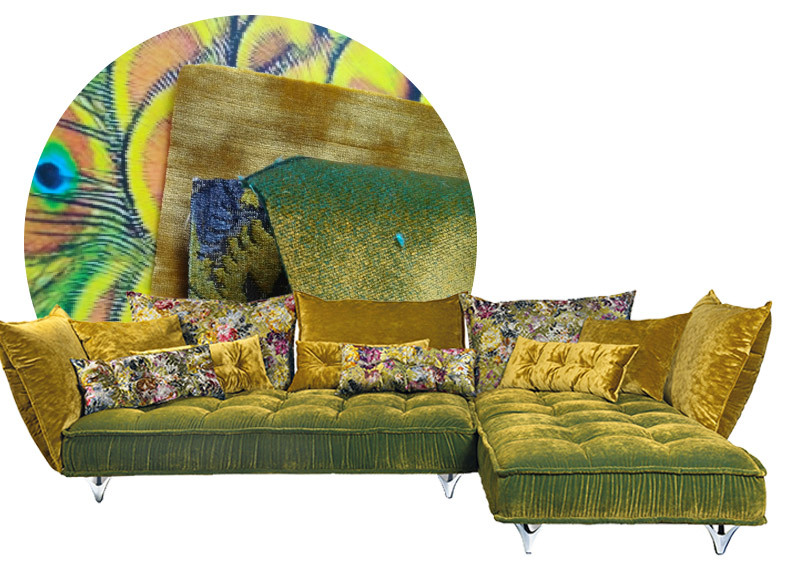 The designer sofa OHLINDA was supposed to act as a cheerful island in the living room, full of joie de vivre; and at the same time it was supposed to be functional. Functionality, however, should not limit the sofa’s expressiveness. The seat’s got the shape of a regular mattress – paying homage to the traditional craftsmanship of the Bretz Company that started back in 1895 with the production of mattresses. The backrests surround the modular seat elements like floating cushions. They may still be detached or re-assembled later on, and the covers are removable. You may create a huge sofa landscape or a straightforward, comparably smaller one. 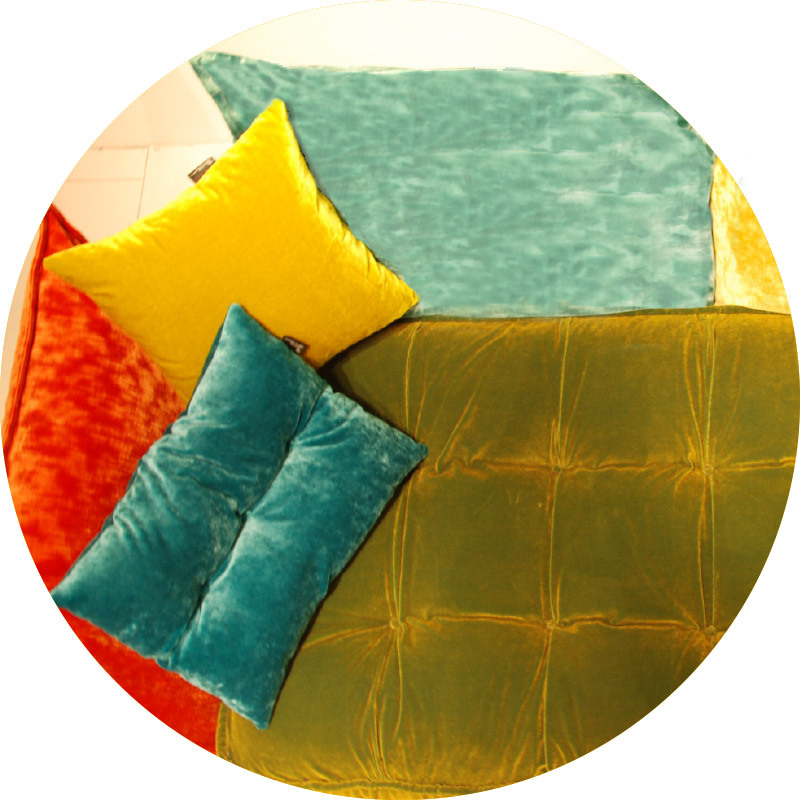 With OHLINDA everybody will be able to create the sofa he or she has always dreamed of, as you may not only combine different elements, but each element may also be upholstered with a different cover. Think of your very own OHLINDA design or get inspired by our product specification sheet. And once you have the OHLINDA Sofa, you may want to add some OHLINDA Chairs and the OHLINDA Bed – all the OHLINDA pieces match just perfectly. One of the main features of the OHLINDA Sofa is the expressive combination of fabrics. Thus, besides OHLINDA’s shape, this was our main focus in the design process. 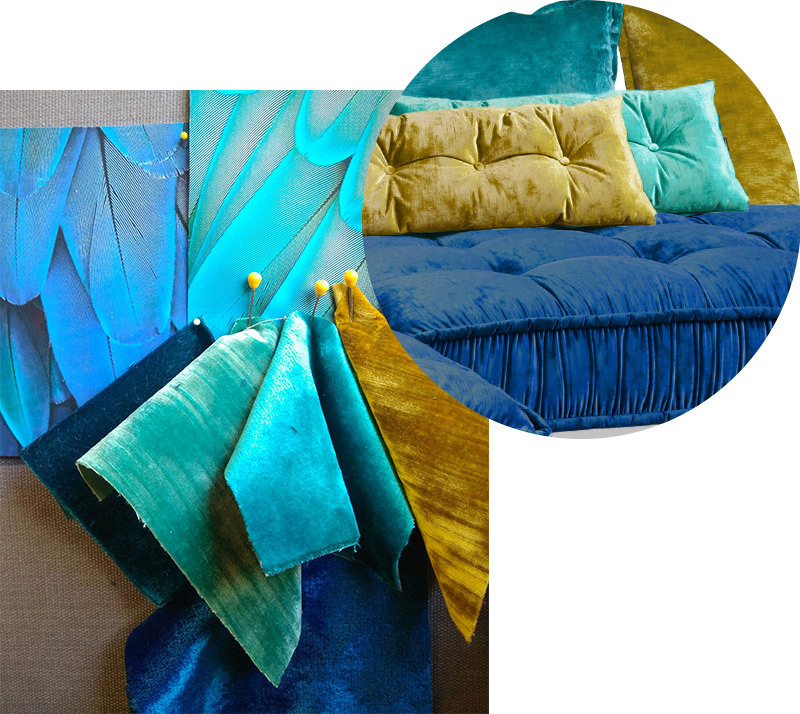 Together with our supplier of velour fabrics in Florence we developed a fascinating, outstanding unicolored quality. In fact, the velour’s color actually glows in a bi-colored way, resembling the bright and shiny feathered coat of a parrot. You are asking yourself what the hell we are talking about? Our midsummer olive velour fabric, of course! This color is composed of two yarns, a turquoise and a golden one; together they glow greenish-golden – and depending on light and angle, this shiny greenish-golden color glows in various ways. Exciting, isn’t it? With its pure olive and golden colors, combined with the noble Gobelin pattern, OHLINDA appears well-balanced and relaxingly calm, but not boring at all. Like a grainfield in the summertime or a shiny golden bird sunbathing in the evening sun. Above a creation in blue, turquois, and golden shades. The fabrics: enzianblau (enzian blue), capriblau (Capri blue), deep blue, gold, and caribicschimmer (Caribbean shimmer). This color combination makes you feel excited and cool – just like going on a freaky summer vacation! The German manufacturer Rohleder that produces fabrics for furniture even created a new and innovative Velours de Gène fabric only for our OHLINDA Sofa. This fabric combines all the different single colors, and the Gobelin pattern relates to a historic document with a digital imprint. Thus, long lasting tradition meets up-to-date techniques, and this fact, in combination with the colors olive, gold, and orange, distributes to OHLINDA’s distinctive appearance. You want to have a look at OHLINDA and experience how comfortable it is? 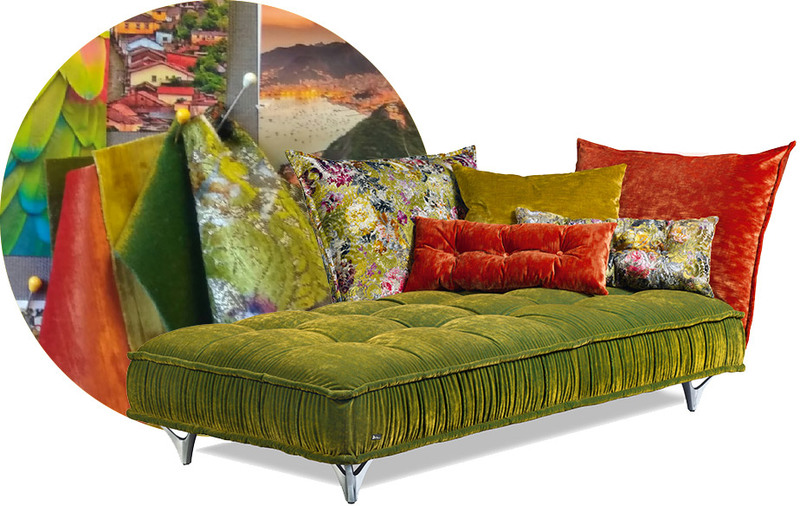 And check out our collection of fabrics and design the OHLINDA Sofa of your choice? Please click here and find the Bretz Store and Showroom closest to you.